Myddelton Square is considered the chief adornment of the New River Estate and is named after Sir Hugh Myddelton who was responsible for building the New River to provide fresh water to London's growing population in the early C17th. The central garden contains some notable trees particularly on the perimeter, with an ornamental garden of raised beds, and now surrounded by new railings. Railed off within the area of the square is St Mark's Church. Myddelton Square is contemporary with Wilmington Square (q.v.) and the last part of Claremont Square (q.v. ), and was built for the New River Estate in 1824-7 on the former site of a large field, Buther's Mantells. Railed off within the area of the square is St Mark's Church, which was built in 1827, some of the stone for which came from Wanstead House demolished in 1821 now Wanstead Park (q.v.). 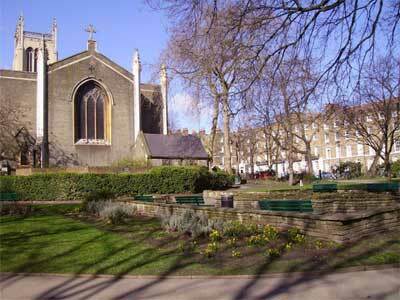 St Mark's was designed by William Chadwell Mylne, an engineer more than an architect who was surveyor to the New River Company from 1811, when he inherited the position from his father Robert Mylne to whom he had been assistant since 1804. Robert Mylne had become famous early in his long and distinguished career as the designer of the first Blackfriars Bridge, and worked on numerous projects throughout the country, predominantly concerned with water, and he named his son after the Chadwell stream that fed the New River. William Chadwell Mylne was equally engaged in projects involving water, working for the New River Company as well as other bodies, including advising House of Lords committees on supplying water to London, and draining schemes in the Fens. In addition to designing St Mark's Church, Mylne was also responsible for laying out 50 acres of the New River Company's land in Islington for building. The church was gutted in 1941 and the north side of Myddelton Square was also destroyed in the 1940s and rebuilt in replica by the New River Company in 1947/48. A modern monument to Hugh Myddelton was erected in the garden but has since disappeared, its defaced plaque remaining.